Japanese automaker Suzuki has bought back a nearly 20% stake held by German carmaker Volkswagen for 460bn yen ($3.8bn; £2.4bn). Suzuki bought almost 120 million shares at 3,842.50 yen each in after-hours trading on Thursday, ending a partnership between the automakers. The deal between the carmakers soured soon after it was formed in 2009. Last month, an international arbitration court ordered Volkswagen to sell its holding. The tie up, which resulted in Volkswagen becoming Suzuki’s biggest shareholder, included co-operation on technology and expansion in emerging markets like India, where Suzuki had a leading position. But Suzuki filed for arbitration in November 2011 after the partnership failed. The companies had agreed to work together on fuel-efficient cars, but Suzuki accused Volkswagen of withholding information it had promised to share. Volkswagen, meanwhile, had objected to a deal Suzuki made to buy diesel engines from Italian carmaker Fiat. 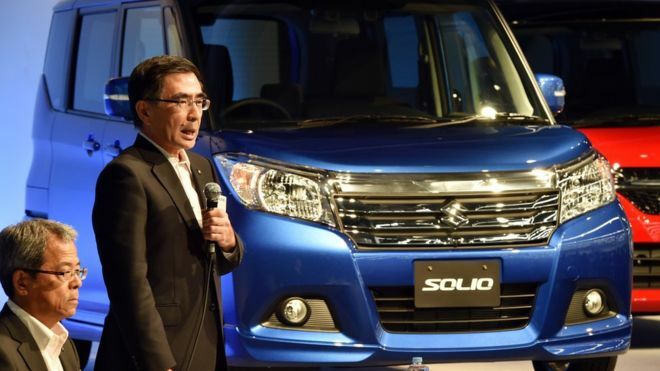 In a statement on Friday, Suzuki said that it did not see a need to change its earnings forecasts for the business year ending in March 2016 in light of the share purchase. Shares of Japan’s fourth largest automaker jumped as much as nearly 5% in Tokyo after the announcement.